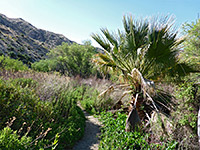 Big Morongo Canyon Preserve was created in 1982 to protect a verdant oasis with springs, streams and varied plant life, in a canyon near the western edge of the Little San Bernardino Mountains, just south of the town of Morongo Valley. 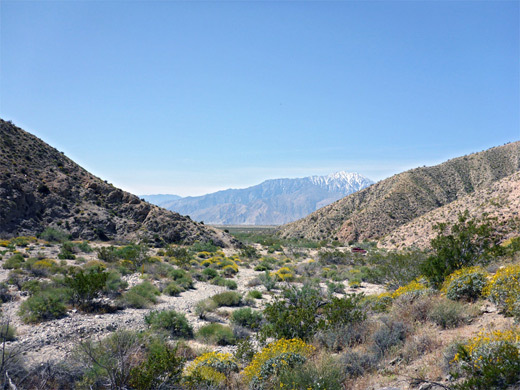 The drainage originates several miles away in forested land around 7,500 feet, and although some sections of the upper reaches contain seasonal streams, the streambed is usually dry as it crosses Morongo Valley, until reaching the springs, from where a riparian corridor extends 1.5 miles downstream. Since 2016 the preserve is contained within Sand to Snow National Monument, probably its most developed and most visited single location. 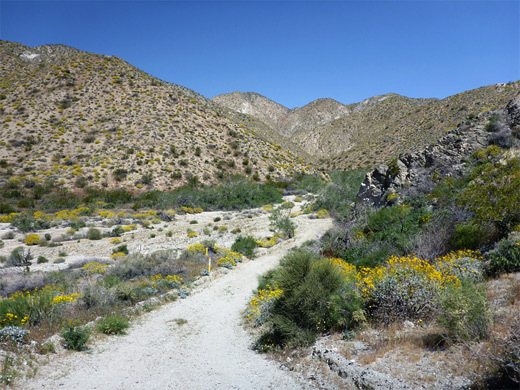 The majority of people come for picnics, camping, birdwatching, or to walk along the network of short paths that cross the springs and marshy areas, but there is also one longer trail, following the full length of this section of the canyon to its mouth on the south side of the mountains, at the edge of Coachella Valley, a point also reachable by road, along a sandy track off Indian Canyon Drive. Entry to the preserve is free. The route, the Canyon Trail, is just over 4 miles, one way, mostly along an old vehicle track, and is relatively easy, with only gradual elevation change; the only difficulties are seasonal, due to the very hot weather in summer. Beyond the upper reaches, where the vegetation includes a few palm trees, most of the canyon is dry, somewhat barren and not especially scenic, though it does contain a reasonable selection of desert plants including the pretty ghost flower, and the lower end is quite dramatic, as the enclosing hills fall away abruptly, revealing the usually snow-capped peaks of the San Jacinto range, on the far side of Palm Springs. Sand to Snow overview map, Big Morongo Canyon topographic map. 13 views of Big Morongo Canyon. 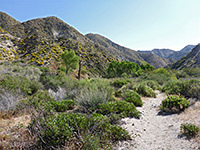 The short road to Big Morongo Canyon Preserve is signed from Highway 62, on the east edge of Morongo Valley, crossing a residential area to a large parking lot, shaded by tall trees. A host is usually on site, to answer questions and provide other assistance, while a series of information boards describe the local plant life, animal life, history and geology. Trail maps are also available. Another road leads to an education center, beside a seasonal buterfly garden, and a path departs from the far side of the parking area, entering the thick, willow and cottonwood forest around the springs; it soon divides at the start of five interconnected loops, mostly all through the overgrown area, crossing streams and passing several pools. 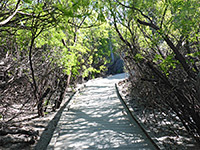 If hiking the main canyon, the shortest route is right at the first junction, along the Marsh Trail, then left and immediately right, now on the Mesquite Trail, followed by a second right on the West Canyon Trail, which connects after a third of a mile with actual Canyon Trail. All intersections are well signed. The first part of the Canyon Trail runs at the base of low, dusty cliffs, with impenetrable undergrowth to the east, completely hiding the stream. The path rises slightly to a ridge that offers views of more arid terrain ahead, then drops down the far side, heading for some taller, whitish cliffs as the drainage bends to the east. All the surrounding rocks were originally granite, since metamorphosed into schist and gneiss. The canyon floor becomes gradually less overgrown, the trees more scattered, and most of the bushes replaced by long grass, and eventually the stream comes into view, usually very shallow. The trail descends to water level briefly then crosses to the far side, by which point the waters have dispersed below ground and for the remainder of the way the canyon is nearly always dry. The trail rises again to another minor saddle, where it meets an old vehicle track that continues all the way to the south end of the canyon. The last cottonwood tree is passed soon afterwards, an old and unhealthy-looking specimen surrounded by big, dead fallen branches. The path/track is now running due east, towards a junction with an east-side tributary, in a wide part of the drainage, 2 miles from the start; distances are indicated by posts, though some are not visible. The canyon seems somewhat shallower, and winds through a few tight bends, the last of which opens out to give the first, fleeting glimpse of the snowy San Jacinto Mountains, 15 miles south. The final 1.5 miles of the canyon has a few shallower bends separated by longer straights, before the final curve, where the canyon opens out and a fence marks the southern trailhead.